In March, Mason Head Coaches Todd Bramble of Women’s Soccer and Jaclyn Simpson-Kirr of Women’s Volleyball teamed up to provide a new kind of cooperation practice for the athletes. “This period in our season involves a lot of intense training and few games. You just can’t train hard for five days in a row,” Bramble said. In order to break up the intense training, the volleyball and soccer teams take a day to teach the other team their sport. “It allows us to break up the week from a physical standpoint and is just the right thing to do for the players. Soccer is a high-concentration sport, and in order to stay competitive we have fun days like yoga or kickball to build morale and make the Division 1 college experience more memorable,” Bramble said. Bramble pointed out that the athletes benefit from these collaborative practices in other ways as well. “There is a lot to be gained, even if that is to laugh and have fun. When playing a different sport, the athletes are put into a different situation and at times new leadership roles were taken,” Bramble said. The athletes on both sides felt a mixture of emotions going into the practices. This first-time trial run period for women’s soccer and women’s volleyball left the athletes with an “exhilarating” feeling, as junior midfielder Kaila Williams, one of the captains of the Women’s Soccer team said. “The volleyball team was very encouraging and welcomed us with open arms even when we couldn’t complete a pass or defend a spike correctly,” Williams said. Just like when athletes of different sports practiced with the Women’s rowing team, the athletes participating in this event gained a new respect for the athletes of the other sport and learned that they had more in common than they thought. “Practicing with each other displayed our work ethics. 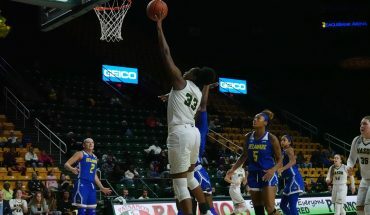 Every time we train, whether it is in the gym, the weight room or individual practices, there is always the focus of getting stronger and better,” freshman Jessica Onuorah, a member of the Women’s Volleyball team, said. As they practiced each other’s sports, the athletes became sore in different places than they were used to as well. “The girls on the team were so sore from volleyball. My forearms were so red,” freshman goalie Kari Blaszak said. “I benefitted from an appreciation for another athlete’s sport and being able to understand that other sports put in just as much as we do on the Volleyball court,” freshman Kelly Fagan from the women’s volleyball team said. The idea of teaming up for practices may be new to women’s soccer and women’s volleyball, but for the Mason Crew Club, it is a 25 year old tradition. Every year, a Pentathlon, started by Sean Parker and Cindy Parker in 1992, is held that incorporates other sports’ teams, past alumni and organizations such as ROTC. “Sean and Cindy Parker wanted to see us host an event after the long winter break that would give rowers more of an incentive to keep training hard over the six week break from regular group training when classes are in session,” Robert Spousta, head coach of the Mason Crew Club, said. During the fall of 2015, head coach of women’s rowing Ted Nagorsen introduced other athletes in the department to the sport. “We roll off campus to the Occoquan Reservoir and are on the water by 6 a.m. every morning,” Nagorsen said. Nagorsen’s intent with these exercises is to build an athletic community that allows the athletes to interact with athletes outside of their sports as well as earn a new level of respect for other athletes as they push themselves outside their comfort zones. All of the efforts these coaches have put in have allowed the Mason Athletic Department to grow to new heights. The athletic department is developing into a community of athletes instead of a grouping of individual sports. Implementing different practice regimens not only allows athletes to develop physically and mentally, but to be more involved in the community.